A squeeze page is a landing page designed to entice a person to subscribe to an email list. They are usually short and completely viewable without the need to scroll. A squeeze page has one main purpose. That purpose is to get a person to enter his or her email address and opt-in to your email mailing list. Let’s explore what actually makes a high converting squeeze page. Here are the elements that a great squeeze page should contain. A squeeze page should be designed around some type of irresistible offer. It should solve a very specific problem and only be available from you. The irresistible offer should also be highly targeted to your email lists market. The headline should be powerful and get the reader’s attention fast. It should be benefit loaded and form a connection with the target market. Take your best offer benefit and work it into your headline. Make a list of all your offer’s benefits. Now take the best ones and list them using bullet points on your squeeze page. Use a strong call to action above your subscription box. It should further entice to reader to subscribe today and not wait. Work in some form of scarcity if possible. Use page design or graphics to guide the reader’s eyes to the subscription box. A high converting squeeze page should be short and to the point. Since a readers attention span is very short, it needs to grab their attention in seconds and promise them that their problem will soon be solved. The squeeze page is the start of the relationship building process. So keep that in mind when designing your perfect high converting squeeze page. Welcome back! Today we will be adding a call to action text block to our nifty squeeze page. We will be using a new HTML container tag. So let me introduce you to the paragraph <p></p> tag. 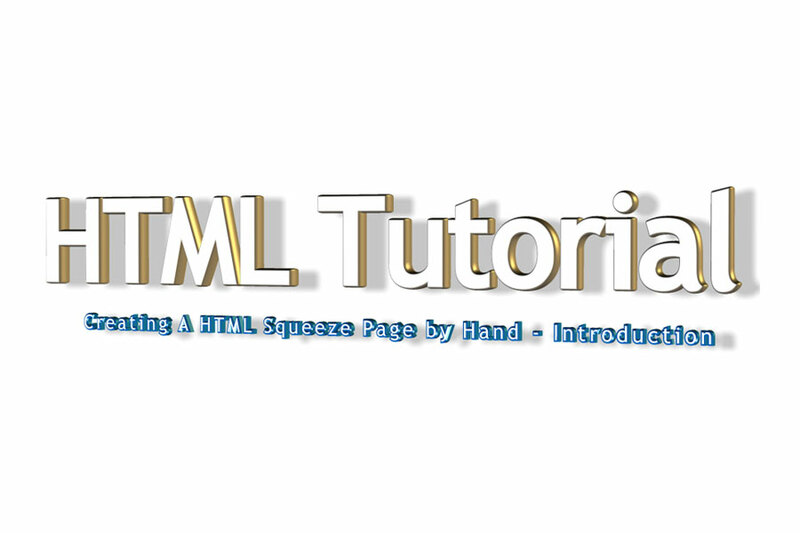 The paragraph tag is one of the most used HTML tags. It is used to contain a single paragraph of text. You simply enclose each paragraph in a beginning <p> and ending </p> paragraph tag. The browser will take care of the basic formatting and spacing of each paragraph. OK, so load the page we have been building back into Notepad++. It should look like this. Since we want our call to action text below the headline, we will add it just below the <h1></h1> container tag div section. We will place the paragraph container inside a div container since this is a new section of the page. Go ahead and do that now. Now let’s add the actual text. We add the text between the starting <p> and the ending </p> tags. Save the page now before you forget. Remember how to view the page in your browser? Let’s view it now. I don’t know about you, but I don’t like the way the text just goes across the browser in one long line. Let’s do something about that. We will be using a new tag to break the long line into two shorter lines. The new tag we will be using is the line break <br> tag. This one is unique as it is not a container tag. So it does not have a ending marker like the others we have used have. We simply insert the line break <br> tag where we want to break the line. Let’s do this now. Let’s also center the call to action text the same way we centered the headline by adding style=”text-align:center;” to it’s div container tag. Save your page and then view it in your browser. Much better, don’t you think? The text is a little small but we will make it bigger a little later in this tutorial. Well our squeeze page is slowly starting to take shape. We will add more to it in the next part. See you then. 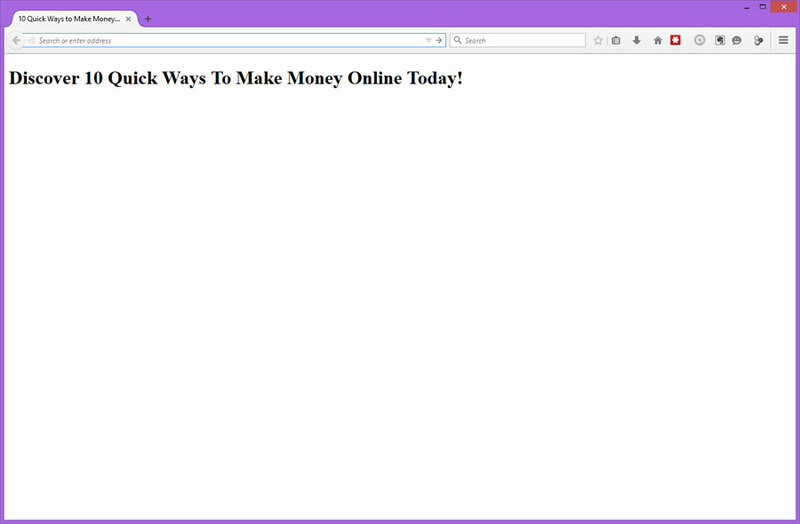 Are you ready to do something with that awesome blank HTML page you created? Let’s add our very first visual element to the page. Let’s add the headline. First let me introduce you to the next HTML container tag you are going to use. It’s the really boring DIV tag <div></div>. A HTML page typically has multiple sections. For example, a squeeze page can have a headline, an introductory paragraph, a subscribe form and maybe a footer. The DIV tag can be used to contain each of these page sections. A DIV tag also let’s us easily change the look of each section easily. For example, you could change the text type, the text color, the background color and the text alignment all by making small modifications to the div tag. I’ll show you more about this later in the tutorial. OK, so load the page back in to Notepad++ that we have been working on. It should still look like this. Got it loaded? Great! Let’s dive in and add that headline to the page. Add the DIV tags where we want the headline to display. Since we want it at the top of the page we are going to add them just below the <body> tag. Go ahead and add them. Your page should now look like this. Remember to save the page so you don’t lose the changes. We want the headline to be big and stand out. So we are going to have to use a new tag. Let me introduce you to the heading tag! There are actually six heading tags but we are only going to use one of them. We will be using the <h1></h1> tag. The H1 tag is used to define the most important heading on the page. In this case it’s our headline. The default formatting for the H1 tag is to make the text large and bold. This can actually be overridden but for now we are keeping things simple. So, we will just use the H1 tag without any format overriding. You place the text of your headline between the starting <h1> and the ending </h1> tag. So let’s add that inside the DIV tag we just added. Save your document and then view it in your favorite browser. Remember how to do that? On the top menu bar in Notepad++ click on the “Run” drop down menu. See the menu entries that start with “Launch in?” Well click on the one that refers to your favorite browser. Here is what you should see if you selected Firefox. The headline does not look good left justified. Does it? Let’s center it on the page. We will do that by revisiting that really boring DIV tag and add a little code to style it’s contents. WOW! We are just in part 2 and we are already going to learn a little CSS! To center the headline in the div we are going to add the following to the starting <div> tag. What this code does is it tells the browser to center the text that is contained inside the opening <div> and the closing </div> tags. Here is what your modified DIV tag line should look like when you add the above code to it. So your document should now look like this. Go ahead and save your changes and view it in your browser again. Much better. Don’t you think? Well I think it’s time to go grab another celebratory beverage and give yourself a round of applause. Your blank page now has a headline. We will add more to the page in the next part of this tutorial. See you there! 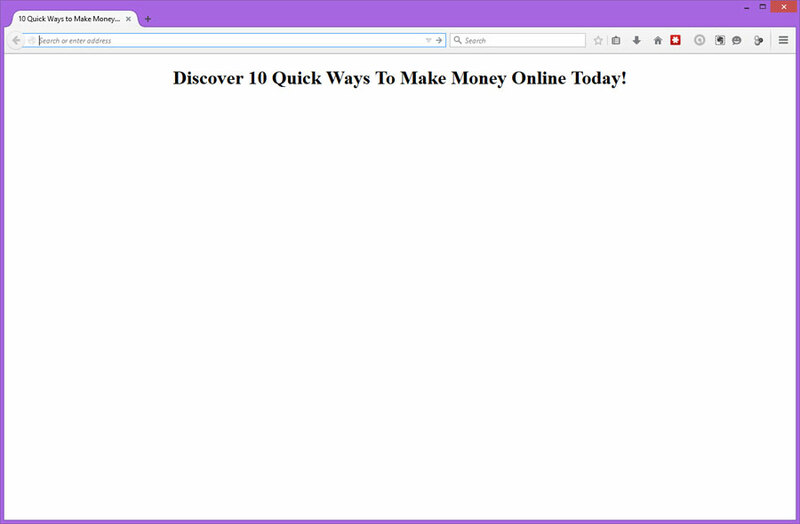 What I am going to show you today is how to create a blank page! Sounds exciting doesn’t it? Don’t worry, we will be adding stuff you can actually see in the next part of the tutorial. You will need a plain text editor to create your page. Do not use Word or any other word processing type of software. It will cause you nothing but headaches. You can use any plain text editor you want. I will be using Notepad++. You can get a free copy of it by clicking the link below. In fact, just go get a copy now. It will make it a lot easier for you to follow what I am doing in each step. Got Notepad++ installed? Great! Let’s move on. Fire up Notepad++ and create a new blank text document. Now save it where you can find it and name it squeeze.html. You will have to click on the File menu and then Save As… since the text document is totally blank. Once you start adding something to the document you will be able to just click on the save icon in the tool bar instead. The above line must be the very first line in the file. It is known as the doctype declaration. It tells the browser what type of document it is so it knows how to display it properly. In this case the doctype declaration is telling the browser that it is an HTML5 document. You don’t need to remember that, just start each HTML file you create with it. HTML documents use tag containers to let the browser know what is contained on the page so it knows how to display the contents of each tag container. This is where most people start to freak out and quit trying to learn HTML. It’s not difficult and most people expect it to be difficult so THEY make it difficult. Just keep saying to yourself, this is easy, this is easy, this is easy. Because it really is. Each container uses two tags. A start tag and an end tag. Examples of containers are paragraphs, headlines and the entire page. They basically say for example… HEY browser! This is the start of a headline and the headline goes until you see the closing tag! This will become a lot more clear to you later on in this tutorial. So get ready for that light bulb to come on over your head and then explode. Are you ready to meet your first tag? I sure hope so, because it’s coming now whether you like it or not. Meet the HTML tag <html></html> That’s actually two tags. The starting HTML tag and the ending HTML tag. This tag tells your browser that everything between the starting <html> tag and the ending </html> tag should be treated as HTML code. Now let’s add the HTML tag to our document. Add the two tags below the doctype declaration you had already added. Your document should look like this now. We will be adding everything else between the HTML tags. The next tag I would like to introduce you to is the HEAD tag <head></head>. Moat of the stuff that can go in the head tag area is for search engines, bots and the browser. Since we are keeping things simple, we are going to only place one item in the head tag area. I’ll get to that in a minute. Now add the head tags <head></head> just below the starting <html> tag in your document. It should now look like this. Don’t forget to save your document from time to time as you add additional lines and text to it. Let’s now add the very first thing a human eye can see. We are going to add the TITLE tag and the title of the page. You know, the text you see above the browser tool bar or in the browser page tab and in search engine results? That’s what we are going to add next. Meet the TITLE tag <title></title>. Let’s add it to our document along with a title for this squeeze page we are creating. Add it just below the starting <head> tag. Your document should now look like this. Now let’s add the actual text for the title of the page. You add that between the starting <title> tag and the closing </title> tag. Your document should now look like this. Did you save your document? Good! Now let’s move on. The next tag I want to introduce you to is the BODY tag <body></body>. This is where all the magic happens. Your actual squeeze page that the person sees in his or her browser will reside inside this tag. Let’s add it to the document we are working on. It goes just below the ending </head> tag. Your document should now look like this. Now save your document. We are going to see what it looks like in a browser next. If you took my advice and downloaded Notepad++ and of course are actually using it, this next step is going to be easy. Did you click it? Good! 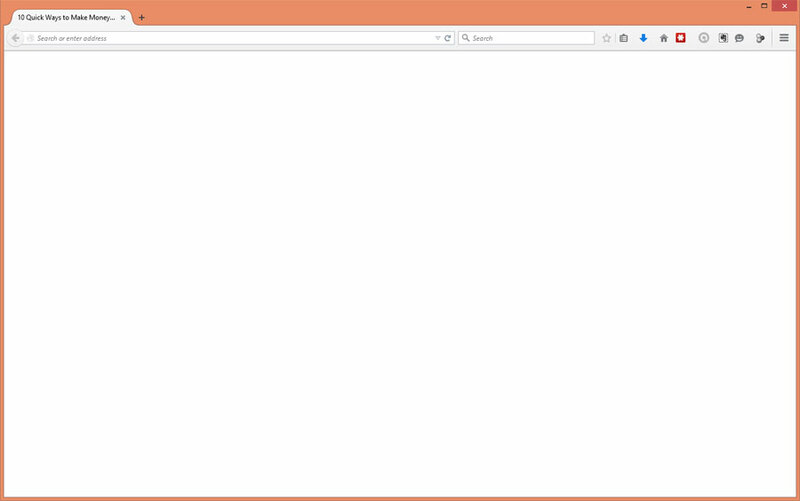 Now you should see your brand spanking new blank page in your favorite browser. See the title of the page on your browser tool bar or page tab? 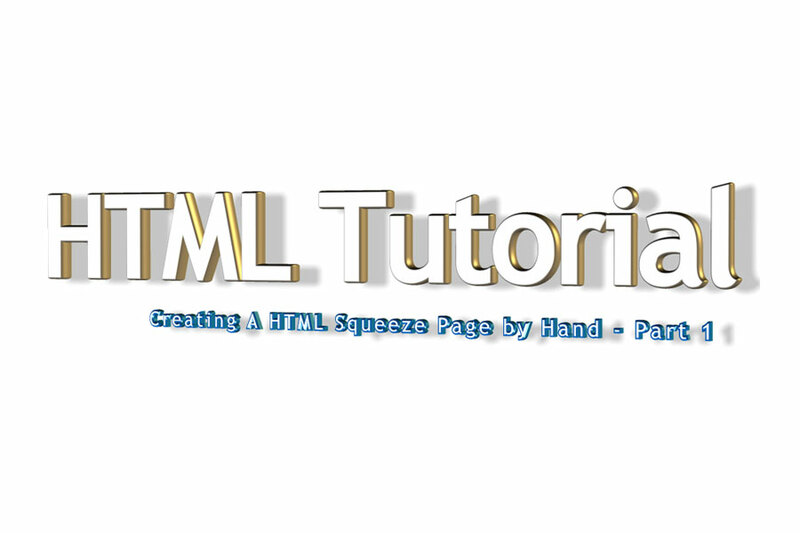 This is going to be a series of articles that shows you step by step how to build a squeeze page using just HTML and maybe a little CSS. It will be light and fast loading. You will not need WordPress or any expensive WordPress plug-ins. In fact, I am going to show you how to do this using nothing but free tools. With that out of the way, this tutorial series will not read like a text book. It will be more like me sitting beside you and showing you each step. Each part of this tutorial will build on the previous parts. So make sure you read it from the beginning and don’t skip around. Also complete each part on your own before moving to the next part. Actually doing each small step will help you to learn and understand what I am showing you. 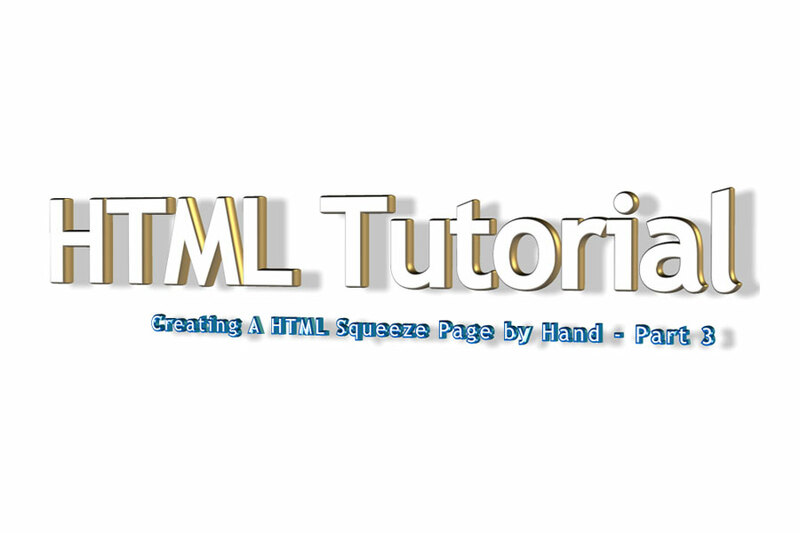 We will be using HTML5 to build our squeeze page since this is the latest and greatest version of HTML. You can do a lot of fancy stuff with HTML5 but we are going to keep it simple in the beginning. We will get fancy later. The easiest way to get people to opt-in to your email list is to bribe them to do it. You need to offer them something that will be of value to them in exchange for their name and email address. Let’s discuss several bribe ideas that you can use to get people on your email list. You could write an ebook that covers one or more aspects of your list niche. It does not have to be long. In fact it can be something as simple as an introduction to a subject. Just keep in mind that it needs to be something someone would really want. If you sell a larger product, why not create a smaller version of it and give that away as your bribe? Not good at writing? You can purchase private label rights for a product that would be a good fit to your list and use that to bribe them to opt-in. You could use it as is or re-write parts of it to make it better. 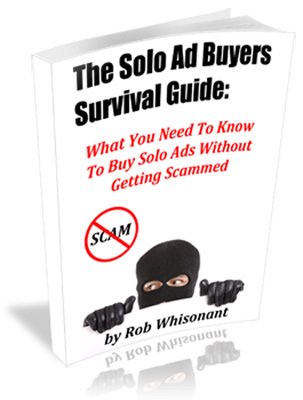 Personally I would at least create a new ebook cover for the selected PLR product. Don’t like to write? How about creating a video? You can create an introduction video or one that teaches a specific subject. You could also create a training video that shows people how to use a specific software program or script. The one thing really nice about videos is that they are easy and quick to create. Like to talk? You can create a mp3 audio file explaining how to do something and give that away as your bribe. Lots of people like these since they can listen to them while they drive back and forth from work. Does an affiliate program have an informational video sales page? You can offer access to it as your bribe to get someone to opt-in to your email list. Just set your autoresponder to send the person to your affiliate link instead of a regular thank you page. Plus you have a chance at making an affiliate commission. 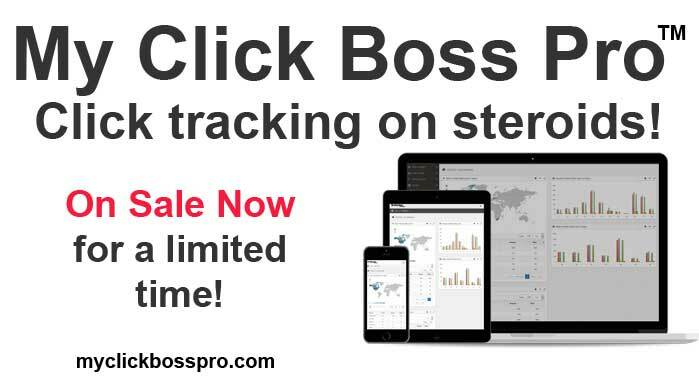 Want to get your email list subscribers use to looking out for your emails? You can offer a multi part mini course and send it out over several emails. Send the first lesson as soon as they opt-in and the rest at set intervals. Can you provide several articles, ebooks, mp3 files and video files as a bribe? How about access to a forum where like minded people can meet and have discussions? You could put this all in a membership site and offer a free membership to it for opting in to your email list. This method also gives you another way to engage with your subscribers. I love using discount codes as a bribe. Take one of your older products you sell and offer a discount code for 100% off the purchase of it. Then later on you can upsell them to a newer edition or version of the product. You can offer to giveaway a paid product each week or so to a random subscriber to your email list. If the product you are giving away has a high perceived value the random drawing should attract a lot of opt-ins to your email list. Do you sell a high dollar consultation or course? You could offer short email consultations for free as your bribe. Would your niche be well suited for having a Facebook group? You could give access to it as your opt-in bribe. Plus, this gives you an additional way to communicate with your subscribers. Do you sell software or scripts? You can create light versions of them and give those away as your opt-in bribe. Then continue to upsell them to the full versions. Do you have a list of resources that people in your niche would want? You can compile that list into a PDF and give it away for free to everyone that opts in to your email list. 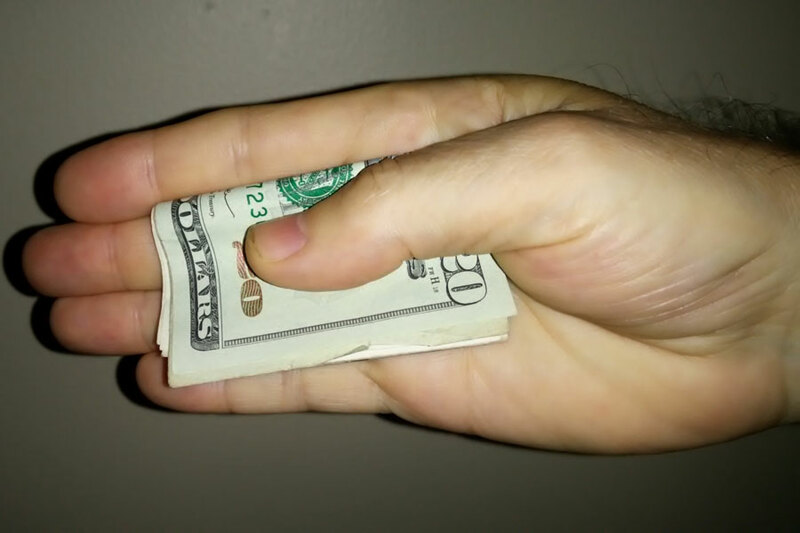 I have given you several ideas you can use as bribes on your opt-in squeeze page. Just pick the one that is best for you. Or come up with your own twist on one of these ideas. You may want to experiment with several different types of bribes and see what one works best for growing your email list.